By now anyone with an Internet connection and who pays attention to videogame news would be aware of the problems Sony are facing right now: firstly that the PlayStation Network had to be taken offline indefinitely and secondly, because its security and therefore users’ personal information was compromised. The ramifications of this are extremely serious and it’s no surprise that mainstream media and news outlets -- normally uninterested in the games industry -- are reporting on this problem, some even including it as their main story. When the possibility of credit card details being stolen from Sony’s network is involved, it’s serious business and on a global level, too, but even if you take the credit card issue out of the equation potential identity theft and fraud is still a massive cause for concern and it’s good to see it being treated as such, even if it impacts on Sony’s reputation negatively in the process. Three questions are being asked: Why did PSN go down? Why have Sony taken so long to communicate those reasons to its customers? And how did they allow such a thing, on such a serious level, happen in the first place? These are valid questions and absolutely the first ones that need to be asked, particularly if credit card information is involved, but I’d like to add a couple more, too: How will it affect things going forward, for the industry as a whole and outside of it as well? What happens once the initial problem and the justified panic that it caused, passes and things, for the most part, return to normal? Something tells me it’s more complicated and more far-reaching than we all may think, right now, under these worrying circumstances. To begin with, what does it mean for online, supposedly secure infrastructure? What will Sony do -- how will they rebuild their network -- to ensure such a thing never happens again? How will Microsoft react with regards to Xbox Live’s system? And what about Apple, eBay, Amazon and any other major player who have such a strong online market presence? While it’s easy to think and assume this is a videogame industry exclusive issue, it’d be naïve and arrogant of the aforementioned companies, game related or not, to ignore this catastrophe and not examine their own services. Obviously theirs would be built and operated differently to that of the PSN which makes Sony’s problem easy to dismiss, but to ignore this opportunity to evaluate their own infrastructure would be a detriment to them and their claims of consumer security being the top priority, and may even inspire hackers to go after them after displaying such (potential) arrogance. Industry in general needs to watch this debacle closely because its impact on online business and commerce is, or should be, significant. To go in a different direction, what does it mean for digital distribution? Supposedly becoming the standard in five to ten years, how will a hacking problem so severe that an entire online service is taken down and rebuilt affect the viability and general attitude of buying games, music and movies on the Internet? Like CDs and print, most people seem to believe that brick and mortar shops are approaching death -- will that belief now change among general consumer and industry sentiment and, if it does, how will it change the immediate to near technological future? Only time will tell but the drama Sony is facing right now goes far beyond just videogames and could, possibly, change the way things are done in the future. The repercussions are massive but whether anyone realises the extent of just how much, right now at least, remains to be seen. To deviate yet again, consumer reaction has been unpleasant. It would be easy to say that any anger and frustration directed at Sony and this dilemma is warranted and completely justified, but even so I feel like attitudes towards the situation haven’t been as well considered as they could be. Insults and complaints are nothing new when something bad happens or goes wrong in this medium -- in some respects, it’s part of game culture whether we like it or not -- but even so, slagging Sony off for this problem, while done with good intentions, is of concern and doesn’t demonstrate the kind of understanding of issues like this that we should have, especially as most of the people ranting are adults. It is, essentially, misdirected anger because while the situation should have never happened to begin with, it wasn’t Sony’s fault that they were breached and information was obtained. This fury can be overlooked, however; insults and whining because of the simple fact the PSN is down, on the other hand, is absolutely ridiculous and just demonstrates the entitlement and selfish ignorance that a lot of gamers unfortunately have. Complaints about the service being down when the reasons behind it are vague are okay but once people know why it’s down, and that Sony are working to their absolute best to solve this problem, the insults and immature comments should stop. They haven’t and it’s been disappointing to observe on top of an already unfortunate circumstance. It’s not surprising, of course, but on a personal level it would be nice to see people actually think before they speak, for a change, and not just care about themselves. There are other areas to consider as this situation continues, and as people learn from it once it is over. I’m not going to mention them, however, because like everyone else with a PSN account I am concerned about my personal information -- especially since the credit card I used wasn’t my own -- and will be looking to Sony to keep me updated. Their communication has been poor, the debacle as a whole should never have happened, but I still trust Sony and hope they resolve this problem as quickly as they can. 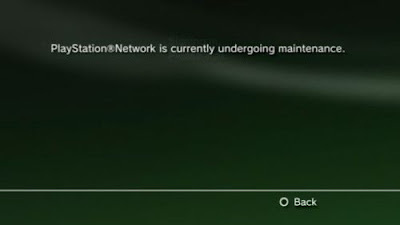 PSN can remain down for as long as Sony needs it to be because what matters is how they deal with it, and how they take responsibility not only for the problem at hand, but with our personal details going forward as well. The focus absolutely should be where it is, but I think it’s worth pondering the longer term outcomes -- rationally -- as well. I’ve tried to approach this topic maturely and without the personal concerns I have with the current problems, as I’ve done with other issues in the past. Whether I have achieved this, and whether you even care (right now), is ultimately up to you. Image gracefully stolen (perhaps ironically) from Kotaku AU.